Designed by Chicago-based firm Solomon Cordwell Buenz in collaboration with Ben Woo Architects, Anaha’s rolling glass façade evokes the light reflecting off the waves of the nearby Pacific Ocean. 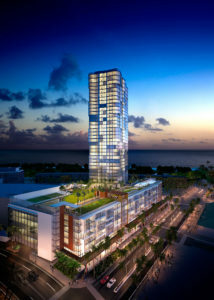 This dynamic tower sets a new tone for the evolving architecture of Honolulu, offering a diverse range of sophisticated residences where the serene privacy of home is enhanced by all the amenities one might expect at a luxury resort, including O‘ahu’s first Merriman’s restaurant. Designed by world renowned architect, Bohlin Cywinski Jackson, in partnership with Architects Hawai‘i, Ae‘o will include 466 residences, a complete offering of luxury amenities and a walkable urban lifestyle in the heart of Ward Village. 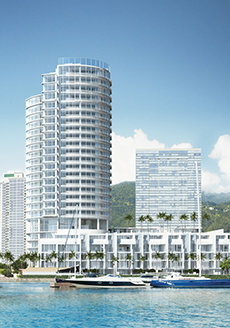 Located on the corner of Queen and Kamake‘e Street and adjacent to the Ward Theatres, Ae‘o will include O‘ahu’s flagship Whole Foods Market and other unique retailers. The Cylinder at Gateway Towers, designed by Richard Meier & Partners, offers a modern residential experience unlike any other. The building has been masterfully envisioned by the architects who have designed some of the most iconic museums, civic spaces, single family homes, and luxury condominiums around the world. Meier’s iconic glass facades beautifully capture the natural sunlight and frame unparalleled views of the Pacific Ocean and Diamond Head. 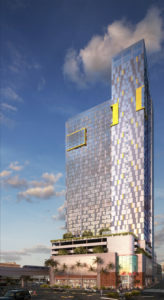 The Cylinder at Gateway Towers offer a rare opportunity to own a Meier home in the sky.